Combine the enchilada sauce with the beans, cooked rice, 1/2 cup of cheddar, 1/2 cup Monterrey Jack and 1/2 cup of corn in a large bowl. Mix well. Place the mixture in an 8x8 casserole. Sprinkle on the rest of the cheese and corn. The corn can be either canned or frozen, just be sure they’re well strained or defrosted before using. 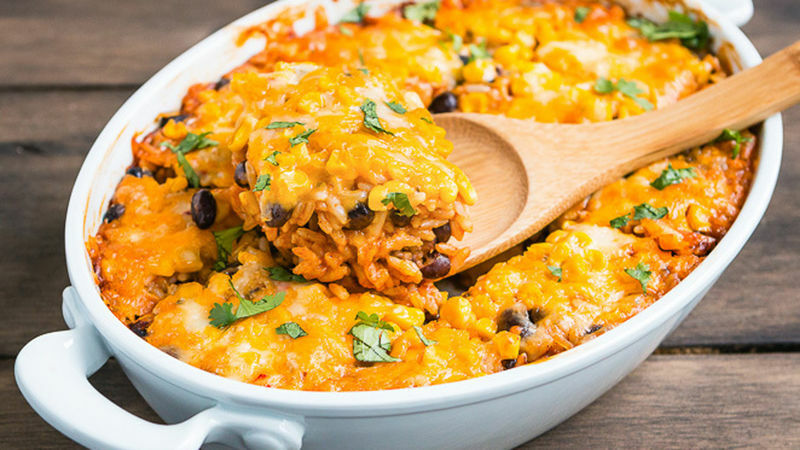 You’re going to love this rice casserole! It’s delicious and very easy to make. If you’re looking for ways to cut meat from your diet, this is an ideal option. This time I used Monterey Jack cheese with jalapeños, giving it a spicy touch, but you can also use the version without jalapeño if you prefer. Prepare it and let me know how you liked it!